The EZPLC series has been discontinued. Please see the ELC-PLC Series as a possible alternative or contact our Automation Engineering department. EZPLC is the most innovative PLC in its class. It is packed with power only found in high-end PLCs that cost 3 to 5 times more. It also sports the most flexible I/O in the industry, EZI/O modules (sold separately). This power-packed micro modular PLC is a good fit for small machines that need high-end PLC performance like fast scan times or a fair amount of I/O or lots of memory, or simply low cost. EZI/O modules are designed with one thing in mind - modularity! 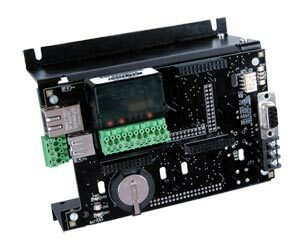 Each and every EZI/O module can be utilized with EZPLC, EZ Series TouchPLC and EZ Series TextPLC for a truly modular I/O. LED indicator lights on every channel to help troubleshoot and debug field wiring. Every EZI/O module has a wiring duct for routing field wiring in neat bundles. EZI/O modules come with male headers to accommodate 11-point removable Phoenix terminal blocks (UL rated for 300V 10 amp 14 AWG) for ease of wiring. Extremely small size, 2 x 2 x 1 inch. AC and DC, analog I/O, thermocouple and RTD modules are available. Combination modules are also available to provide maximum flexibility. NOTE: Programming software (EZPLC-EDIT) and programming cable (EZP-PGMCBL) required. Note: I/O modules not included.